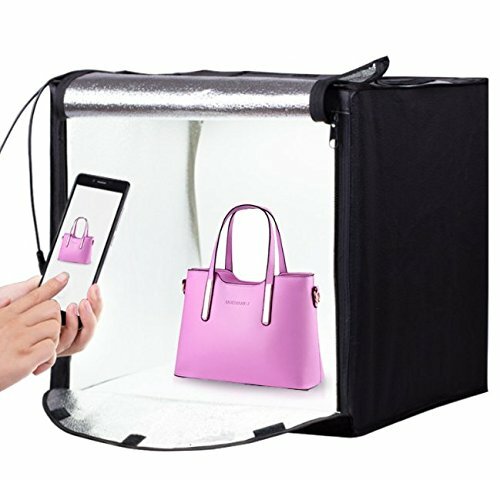 This is by far the simplest solution for improving your 'amateur-looking' pictures and allowing you to easily create professional-quality product shots. Utilizing cutting edge LEDs as light source, you will get as much brightness as 4500 lumens with only 50W rated power. Natural 5500K daylight color provides balanced light ensuring high quality and professional shooting effect. Another benefit of LED light source is flicker free, which eliminates shadows on your photo. It is also safe for artwork because there is no UV or IR. Our LED photo studio lighting box comes with a compact size. You can set it either on your desk or in any other places available. It sets up easily, no other tools needed. If you are challenged for spaces, you can take it down into pieces and put all the parts in the carrying bag provided. The tent has 3 different front flaps, the completely open or a medium size spot open in front of it, a small portion open on top. These openings allow you to take photos from any angles you want. For larger object shootings, you can also zip the front cover open and role it up to get a wider viewing angle. We included 3 PVC backdrops with different colors of white, yellow and black to match with different objects. There is also a diffusing cloth that can be used to avoid reflections when taking photos for glass, jewelry or other shining objects.